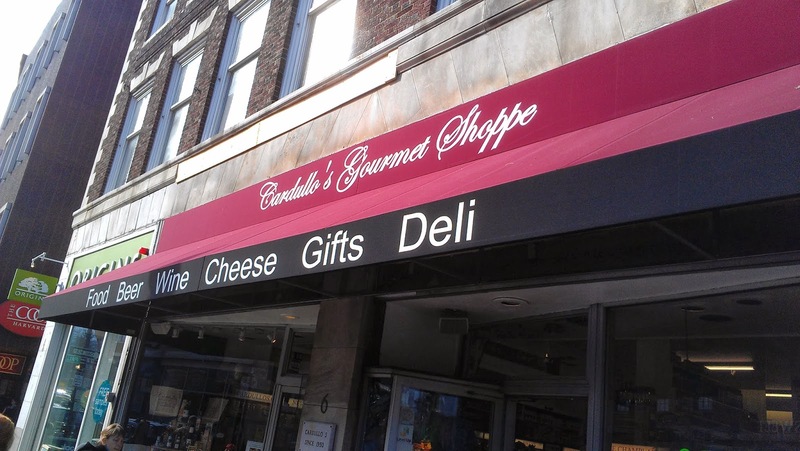 I stopped into Cardullo's Gourmet shop in Harvard Square. The store has a lot of cool products. It has imported cheeses, meats, chocolates, beer and some locally sourced stuff as well. I was interested in the deli counter. 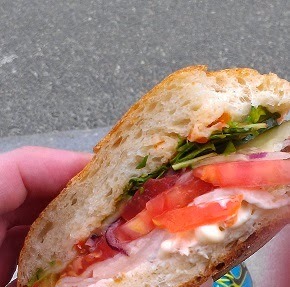 I ordered a custom sandwich with Turkey (duh), onions, tomatoes, onions, cucumbuers, provolone cheese, arugala, and red hots. It was on a cibatta roll. It set me back $7.95. I ate my sandwich in Harvard Square on the steps of some academic building. 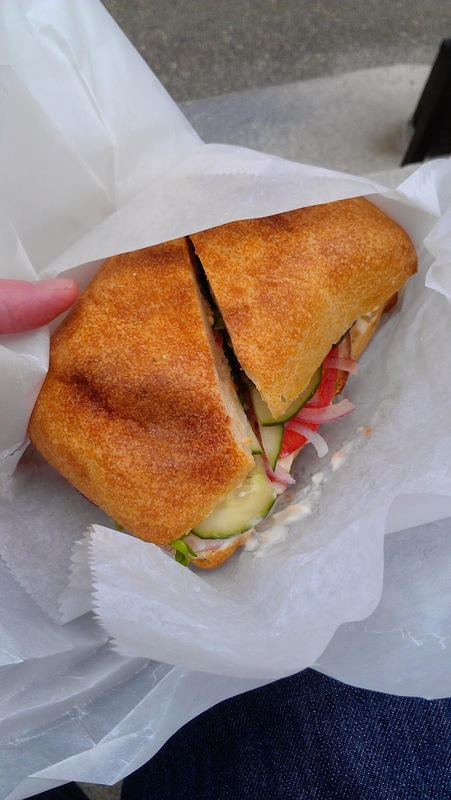 This sandwich was heavy (as far as sandwiches go.) The presentation of the sandwich was solid. It was tightly wrapped in wax paper. The bread tasted fresh. There was a generous helping of turkey, but not too much. The veggies were all crisp and fresh. The tomatoes were especially juicy. My two complaints were that I could barely taste the spice on the sandwich. I like having a little bit of kick, but there wasn't much to be found. Also, there was a bit too much mayo for my liking. It got in the way of the crispiness of the veggies. Overall I'd give this sandwich a 4 out of 5. I liked the fresh ingredients and the texture. It was slightly expensive. I don't think I'd make it a "regular" place, but I'd definitely recommend it. Hob Knob Job Search: What Have you Been Doing? I've been asked a few times by job recruiters, so what have you been doing? And my gut answer is, "Well, I've been looking for a job, desperately." I'd estimate that I spend 5-6 hours a day checking job boards, writing cover letters, emailing contacts, networking, and devising strategies. It's not physically exhausting work, but it's draining. VERY draining. Between the rejection letters, the post-interview waiting, and then the fear that you are just sending out an application that won't even get seen is exhausting. I told myself around November that I'd put most of my energy into finding a job. I figured the more grunt work I put in then, the less I'd have to worry about once I graduated. It really didn't work out that way. Three and a half months later I am kind of doing the same thing. Some days I feel productive, other days I am just zonked. I'm putting stuff on hold because I feel like my energy should be devoted to "job searching." I guess I should have a passion in addition to pouring my soul into cover letters. And this. Ugh. Well, I need a place to vent and this is it. So there. I've been at this job search thing for over three months now. I thought I would be at it for maybe a month. Job searching used to be a linear thing. You would go to school, get a job, and remain there while you could rely on a pension once you finished 40 years later. Now there are so many other factors. You need to "gain experience" with unpaid internships. You need to make sure you have a stellar presence both in-person and online. You need to know people and cultivate your "network." The expansion of the internet has increased our opportunities, but also our competition. There is the idea that you need to be personally fulfilled with what you do. The "economy" is a constant, overarching presence in all of our lives. It's an excuse for hiring managers. It's solace for those offering comfort to frustrated jobseekers. You can't see it, but it runs your job search. I posted a question on my Facebook wall about whether it's better to do some low-paying job (or jobs) at a place you love while worrying about money or have security at a job that you might love, but it would be pretty far from your idea of fun. I got a lot of different responses. I'm not on the brink of poverty (maybe official government rules would say otherwise), but I'm fine. I'm not hungry, rent is paid, and I can have a beer with friends on the weekend. However, there are some opportunities for me on the horizon. One would be a fun place to work, but I'd still be "on the brink" financially and continue to make near minimum wage. The other would be a professional job with serious, professional responsibilities. I'd probably enjoy it, but it might just be a job. Do I continue to worry while doing stuff I really love? Or do I grab some security and jump headfirst into a job behind the desk? There's a part of me that says, "Yeah! Do the fun job! You don't have too many real responsibilities. Your friends will be so jealous of you. You'll still be living the dream." Another part of me says, "Nick, your finances have been a constant worry for you since you graduated from college. You'll figure out a way to stay happy and not become "that guy" who hates his job and thinks he gave up on his dream. You're a happy guy and you're pretty good at figuring what makes you happy. Security doesn't mean sacrifice." I don't mind making changes or choices, but I just want those things to come soon.